BIG Big Finish Week: BLAKE'S 7, 1.1 – Fractures Review | Warped Factor - Words in the Key of Geek. There’s something about hearing a familiar theme tune and knowing that what awaits you is a brand new full-cast adventure that stiffens the sinews of every geek, summons up the blood and puts the squee-sensors on full alert. It’s a sensation powerful enough after fifteen years of releases to make every new Doctor Who release feel like a potential privilege, but when in January 2014, after two years of the still very good but one-or-two-cast member dramatic readings of the Liberator Chronicles and the experiment that was Warship, we got a brand new series of Blake’s 7, it felt like a whole bunch of Christmases at once. Fractures, the first story of that new series, opened up with scenes that sounded absolutely exactly like on-screen Blake’s 7 – the Liberator on the run from pursuit ships, Brian Croucher’s Travis en pointe throughout a dramatic suicide ram move, and the ship, damaged and self-repairing, drifting into somewhere named, with classic Blake’s 7 portentousness, the Derelict Zone. From there, Justin Richards’ script goes a bit Tanith Lee, which many fans of the original show will delight to hear – things are perhaps not what they seem, and even people might not be trustworthy. Certainly, Zen is acting very strangely, but apparently, it’s acting that way on orders from one of the crew. With consummate ease and the kind of logic that means you hardly notice it happening, Richards separates the crew into groups of one or two, so as to give everyone on board their chance to re-imprint their personalities on our minds after what could be a long absence for some listeners, without turning the adventure into a festival of ‘people on the bridge, insulting each other’ – always a danger with a scenario like Blake’s 7, where the characters are strong enough to be at their best while bitching unless forced to do other things. The story picks up pace as the listener’s certainty in the truth of things is progressively undermined, and while it seems likely that there’s a traitor on board, the guessing game as to who it might be intensifies to the point where Avon’s mindset – ‘Trust nobody’ – seems not only to be perfectly rational, but perhaps the only way to survive the Derelict Zone. The only problem is that if you trust no-one, then the survival of each individual is at odds with the survival of everyone else. If there’s no such thing as society, then people start to die. The solution to the increasing number of questions that arise throughout Richards’ channelling of these ideas is pieced out with a sense of pace that makes you wait almost as long as you can stand before things start to make any kind of sense, allowing the listener to be drawn into the sense of disorientation of each of the crew members, wondering who is doing what, and why, and whether the whole Liberator crew has taken leave of its senses, before a dramatic conclusion which re-states the fundamental nature of the Blake’s 7 crew: none of them are perfect, and they’re never obliged to actually like each other very much, or even especially trust each other, but each of them recognises the worth of the other in the enterprise on which they’re embarked – if any member of the crew had no function, they wouldn’t be there. It’s a sense of scorched-earth honesty that allows them to look each other and the world squarely in the eye. They might fall for deceptions based on their own suppositions about each other, but ultimately, they’re stronger together than they would be apart and facing an implacable, powerful enemy in the Federation. As was often the case on-screen, the threat of this episode is vanquished with about five minutes to spare, in order to set up a premise that will escalate the threat going forward – in this case, an expansion of the Federation’s abilities, meaning it now has a kind of Orac all of its own, making it a clear and present threat to our runaway rebels. They have a clue, in that the Federation’s new toy is probably down to someone called Mikolov, and finding them, Avon argues, should now be a priority before Blake’s 7 attacks Star One. In this inaugural episode, Richards’ dialogue absolutely zings when the crew talk to each other, with the back and forth between Avon and Villa absolutely dripping with authenticity. It’s the kind of thing to warm the heart of an ageing Sevener, and for any newbies who are just deciding whether Blake’s 7 is worth getting into, the Avon-Villa repartee will convince them to invest more heavily in the show, if only to understand what makes these two characters tick. Authenticity-junkies will also be hugely heartened by the music that punctuates the episode, which channels Dudley Simpson in every note and every instrument. In performance terms, it’s worth remembering that it’s been over thirty years since on-screen Blake’s 7 ended, and while some of the actors sound almost exactly as they did back in the early eighties – Michael Keating, Sally Knyvette and Jan Chappell all make more than decent fists of recreating their characters here – and some, like Brian Croucher and Paul Darrow always had a snarling, slightly heavier quality to their voices that allows for the absorption of thirty years of ageing, some actors, like Gareth Thomas as Blake, have voices now that have changed to a noticeable degree over the decades. There’s no escaping the fact that Thomas sounds like a significantly older man, for the obvious reason that he is a significantly older man. But you can either let facts like that ruin the return of Blake’s 7 for you, or you can get over yourself and mentally adjust to the older-sounding Blake. Being older is one thing. Being deceased is quite another, and sadly of course Peter Tuddenham is no longer with us. Alistair Lock as Zen and Orac has a slightly different vocal quality, but again, you can let it ruin a great return for you, or you can adjust your memory. Certainly, it’s an adjustment that’s relatively easy to make in Lock’s case, as he pitches the computers very close to Tuddenham’s originals, and long before the end of this first episode, if you’re willing to let them, Lock’s performances will have won you over to the new supercomputers in town. 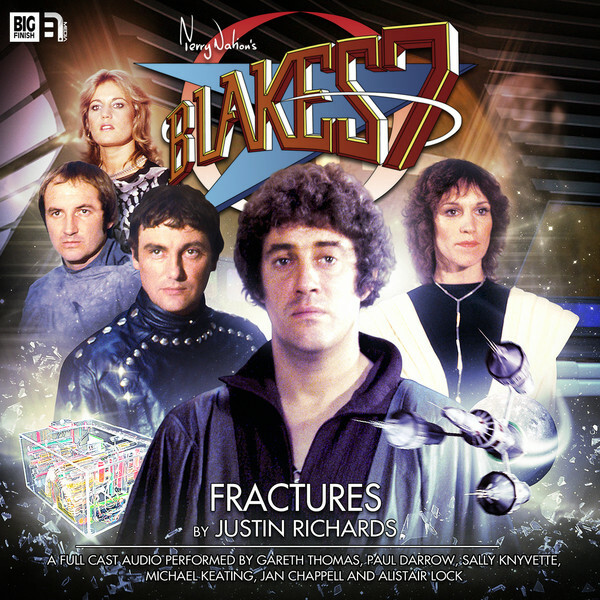 All in all, for a first episode of a brand new audio series of Blake’s 7, Richards and Big Finish stay close to almost all the things that made the on-screen show great during the original cast’s time – space battles, acid banter, mysteries, mistrust and occasional Avonic misanthropy. All that’s really missing in this post-Gan arrangement is an appearance from the Supreme Commander herself, but have patience – Servalan will be along in due course. For now, if you haven’t already got it, pick up Fractures today and revel in the beginning of a whole new era of Blake’s 7 on audio, which is as good or better than the original.